The Irish elk (Megaloceros giganteus) was a species of Megaloceros and one of the largest deer that ever lived. Its range extended across Eurasia, from Ireland to northern Asia and Africa, but a related form is also recorded from China during the Late Pleistocene. The most recent remains of the species have been carbon-dated to about 7,700 years ago in Siberia. Although most skeletons have been found in Irish bogs, the animal was not exclusively Irish and was not closely related to either of the living species currently called elk. For this reason, the name "Giant Deer" is sometimes preferred. The Irish Elk stood about 2.1 metres (6.9 ft) tall at the shoulders carrying the largest antlers of any known cervid, a maximum of 3.65 m (12.0 ft) from tip to tip and weighing up to 40 kg (88 lb). In body size, the Irish Elk matched the extant moose subspecies of Alaska (Alces alces gigas) as the largest known deer. 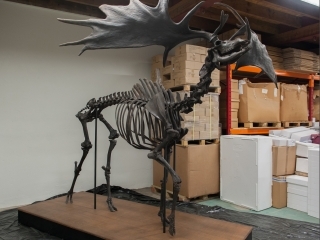 The Irish Elk is estimated to have attained a total mass of 540–600 kg (1,190–1,320 lb), with large specimens having weighed 700 kg (1,500 lb) or more, roughly similar to the Alaskan Moose. A significant collection of M. giganteus skeletons can be found at the Natural History Museum in Dublin. The size of Irish Elk antlers are distinctive, and several theories have arisen as to their evolution. One theory was that their antlers, under constant and strong sexual selection, increased in size because males were using them in combat for access to females. It has also been suggested that they eventually became so unwieldy that the Irish Elk could not carry on the normal business of life and so became extinct. Unlike other deer, M. giganteus did not even have to turn its head to present the antlers to best effect, but could accomplish this by simply looking straight ahead.